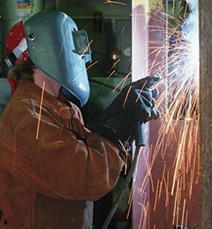 FORESTVILLE WELDING & IRON WORKS, INC. offers steel fabrication for any building project — no building is too large. After designing and creating the steel parts for your building, we provide precision structural steel installation. By hiring only the best technicians who are as efficient as they are safe, we offer guaranteed workmanship on manufacturing and installation services. With more than 30 years of experience, let us build your next structure knowing that our proven service exceeds expectations. Hire the best when you contact us. Contact us and let the best fabricate and build your next steel structure.